On the edge of Chinatown in San Francisco, Filipinos always gravitated to Kearny Street. Known as Manilatown, it was not a tourist trap, just a place Filipinos called home. But by 1977, development was eating up real estate on Kearny Street. Manilatown was down to just one block, anchored by what would become the symbol of the Filipino community, a single room occupancy (SRO) joint, known as the International Hotel, or I-Hotel. Just as the Stonewall Inn is important to the national LGBTQ community, the I-Hotel deserves an important place in the hearts of all Asian Americans. On Aug. 4, 1977, in a brutish display of force, San Francisco police went in and staged a mass eviction of the I-Hotel residents. They were mostly older Filipino men, many of whom had stayed in the residence hotel or used it as a home base since they arrived in the 1920s. The images of police mostly on horseback storming the scene and then one-by-one carrying out the residents was captured on the news that night. But it was Curtis Choy’s documentary, “The Fall of The I-Hotel” that gives the residents’ perspective of the ten-year battle to preserve their homes against corporate developers. It was a fight that began soon after students staged a strike that ultimately gave birth to Asian American ethnic studies at San Francisco State. And then at 3 a.m. on Aug. 4, the evictions began. Choy said police on horseback broke up the “human barricade,” and then firefighters provided a ladder so police could enter the roof. One by one, residents were removed by force. Choy said it was a defeat that sent several activists into “a collective depression” that many didn’t snap out of for years. But in the end, although the I-Hotel was razed, the developers were unable to move forward. For many years, the space was a large hole in the ground, then a parking lot. But it was still a void. Ultimately, community advocates worked out a deal with the Catholic Church for affordable housing, and now there’s a large mixed-use project where the I-Hotel once stood. Part public housing, part Catholic education center, and a small tiny corner for a Filipino community center—what is now known as Manilatown. That’s where Choy and others will gather on Friday to screen the documentary and remember the struggle. Choy admits the new I-Hotel just isn’t the same. “The romance of the community is not there anymore,” he told me. He finds the public housing kind of soulless and “dehumanized” after what he experienced at the old I-Hotel. Sometimes he wonders what would have happened if the decision had not been made to release the human barricade that kept the police from entering the building to evict. Choy can only speculate what might have happened if the barricade hadn’t been dispersed. Given that public housing was ultimately put in place of the hotel, it’s sad that the residents had to be evicted. It’s sadder still that many of the residents died before a sensible community decision could be worked out. Now 40 years later, the anniversary of the evictions comes when the city is faced with a severe affordable housing crisis. It’s the same situation in many urban Chinatowns throughout the nation. That makes this anniversary a good time to revisit with those who witnessed the event, and re-learn the lessons of the I-Hotel. It can only help the current situation, as advocates scramble to avoid a new generation of people being forced out of the city. 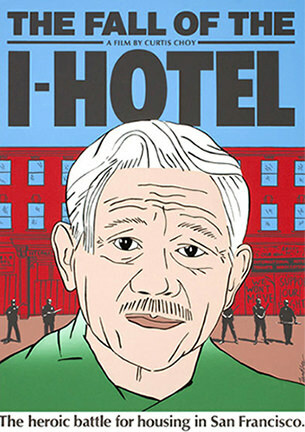 Hear my personal reminiscences of the I-Hotel, and listen to filmmaker Curtis Choy talk about his 1983 documentary, “The Fall of The I-Hotel” on Emil Amok’s Takeout. You can see more about Choy’s Asian American documentaries here.